1. Planned Parenthood is the nation’s largest abortion chain. Planned Parenthood performs over 320,000 abortions a year. 1 out of 8 women visiting Planned Parenthood each year will get an abortion there. Planned Parenthood takes in an estimated $190 million on abortion alone every year, accounting for three fifths of their clinic income. Planned Parenthood is cornering the market on abortion: even as the national abortion rate declines, Planned Parenthood’s abortion numbers continue to rise. 2. Planned Parenthood is a bad actor and a lightning rod of controversy. 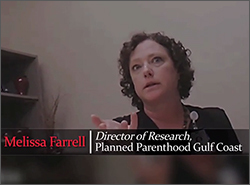 Planned Parenthood has been caught shielding child predators, lying about what services they provide, deceiving government officials, defying state and federal laws, and submitting fraudulent Medicaid claims. What’s more, Planned Parenthood is currently under investigation by both the Department of Justice and the FBI for its role in harvesting and selling fetal tissue. Because of their huge abortion business, unethical activity and partisan political involvement, Planned Parenthood is one of the most divisive organizations in the country. 3. Planned Parenthood exaggerates their role in providing healthcare to women. Planned Parenthood provides less than 2% of manual breast exams, less than 1% of pap tests, and zero mammograms annually. Download this fact sheet. Women cannot go to Planned Parenthood for such basic healthcare needs as treatment for back pain, colds and flus, bodily injury, and mental health issues. Planned Parenthood offers no pediatric care, a primary concern of millions of women, and even instructs women not to bring children with them to their centers. 4 out of 5 women will never visit a Planned Parenthood facility. 4. Defunding Planned Parenthood would not reduce funding for women’s health. Every dollar taken from Planned Parenthood would be redirected to Federally Qualified Health Centers (FQHCs) that don’t provide abortions. Nationwide, there are 16 times more FQHCs than Planned Parenthood centers, serving 8 times more clients. FQHCs offer families a far wider range of services and a higher standard of care than Planned Parenthood. How much taxpayer funding does Planned Parenthood receive from the federal government? Planned Parenthood receives $553 million annually from taxpayers, 43% of their annual budget, of which $430 million comes from the federal government. The balance of their taxpayer funding comes from state and local governments. Isn’t abortion only a very small part of what Planned Parenthood does? Planned Parenthood claims abortion is only 3% of their services, a figure so misleading that Slate magazine called it “the most meaningless abortion statistic ever.” Out of the 9.5 million individual services Planned Parenthood provided in 2016, 321,384 were abortions—roughly 3%. But this figure fails to account for the fact that a woman visiting Planned Parenthood for an abortion will receive several services—from a pregnancy test to some manner of counseling to the abortion itself—each of which is counted separately. Also, abortion accounts for more than 60% of their total clinic income. Don’t you know Planned Parenthood doesn’t receive funding directly for abortion? Even if Planned Parenthood does not receive federal funding directly for abortion, the $430 million they receive from the federal government helps them to keep the lights on, staff their call centers, and market their business. Moreover, offering taxpayer funded services also provides Planned Parenthood with a large population to market their abortion services to. Taxpayer funding is propping up the nation’s largest abortion chain. Why do you want to take healthcare away from poor women? Nobody is trying to reduce poor women’s access to healthcare. Every dollar taken from Planned Parenthood would be redirected to Federally Qualified Health Centers that provide a far wider range of services and a higher standard of care than Planned Parenthood. Doesn’t Planned Parenthood reduce abortion by providing contraception? half of women getting abortions were using contraception during the month they became pregnant. What can you do to help defund Planned Parenthood? Keep up with the #DefundPP effort! Visit ProtestPP.com to stay up to date with action items, rallies, protest and more. Pro-Life Q & A: Planned Parenthood. #ProtestPP is a coalition of state and national pro-life groups organized in response to the horrifying revelations in the summer of 2015 that Planned Parenthood has been involved in the illicit trafficking of aborted babies’ body parts. The primary sponsors of #ProtestPP are Citizens for a Pro-Life Society, Created Equal and the Pro-Life Action League. 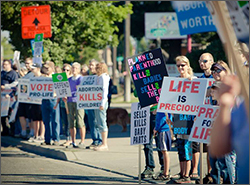 These three national activist organizations are joined by over sixty state and national pro-life groups committed to exposing the truth about Planned Parenthood and mobilizing the response of pro-life Americans. On August 22 and October 10, 2015, tens of thousands of Americans answered #ProtestPP’s call for a national days of protest at Planned Parenthood centers. In all, 654 individual protests were held at 374 Planned Parenthood facilities throughout the United States—including abortion clinics that had not seen pro-life witness in years. The protests received outstanding media coverage, reaching millions of Americans, and in August, #ProtestPP was the number one hashtag trending on Twitter and Facebook. In April 2016 #ProtestPP launched the first-ever annual nationwide Planned Parenthood protest, with plans to hold such a nationally coordinated event every April. 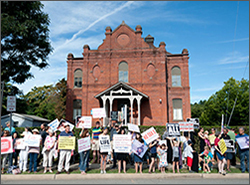 And in October 2016, #ProtestPP prayer vigils were held at over 100 Planned Parenthood locations to mark the organization’s 100th anniversary. Now #ProtestPP is focusing on the fight to strip Planned Parenthood of their federal funding and shift those taxpayer dollars to Federally Qualified Health Centers that offer a far wider range of services and do not perform abortions. Thank you for contacting #ProtestPP. If your message requires a response, you should hear from a member of the #ProtestPP national team within 2 business days. No, I just want to send a message. The #ProtestPP national team can be reached using the contact form on this page, by email at info@protestpp.com, or by phone at 773-777-2900. To purchase “Getting to Know Planned Parenthood” flyers for distribution in your community, use the order form here.